Why is the 2019 Chevrolet Silverado 1500 the best truck for Broken Arrow, OK? If you’re the kind of person who gets the job done, then you should have the tools that will too. The biggest and best tool you have is your truck. 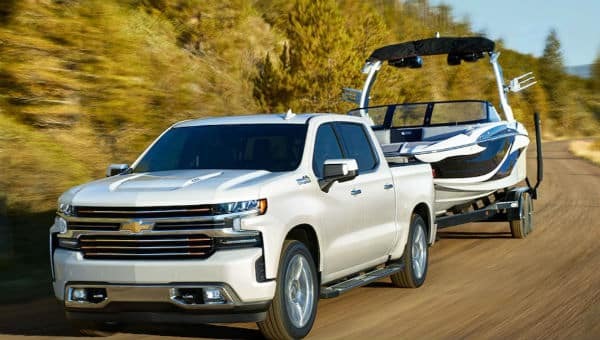 The 2019 Chevrolet Silverado 1500 is a tough, high-performing vehicle that will tow and go wherever you need it to. You can load it up with payload and still get great efficiency on gas mileage. The new sophisticated design of the truck will turn heads in Broken Arrow, OK and you’ll have the hardest working truck around. The Silverado 1500 has a large bed and great features for hauling everything you need. Keep reading to learn more about its award-winning features. The 2019 Chevrolet Silverado 1500 is a high-performance vehicle. Not only does it tow and carry payload, but it also handles well and can go wherever the road takes you. The suspension will withstand dirt roads and construction sites, plus the durable body and frame will not break on you. This truck is a versatile, reliable, and economic vehicle. 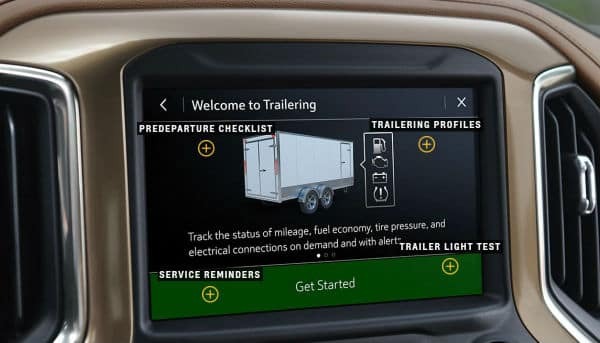 Check out some of the great performance features that have been built in to the new 2019 Chevrolet Silverado 1500. Come test drive the 2019 Chevrolet Silverado at Keystone Chevrolet 1500 near Broken Arrow, OK. You’ll be able to feel the raw power and won’t want to go home without it. The 2019 Chevrolet Silverado 1500 is a vehicle that can be used as your mobile office. That being said, you’re going to want it to have some comfort and some technology that will help keep you productive. This vehicle has an interior that is built to take a beating but also won’t skimp out on the extra amenities. You’ll be riding around in a comfortable and technologically advanced vehicle that can get the job done right when you need it to. 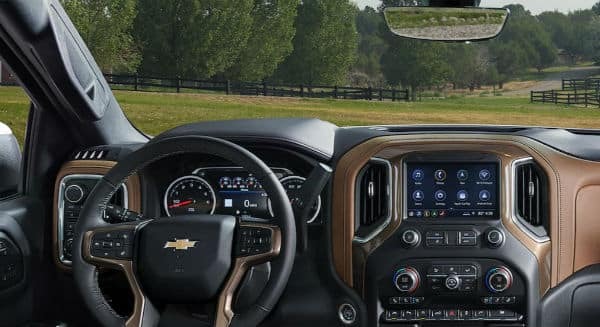 Take a look at some of the highlighted features on the 2019 Chevrolet Silverado 1500. Don’t spend your days in a vehicle that is stuffy and uncomfortable. Test-drive the 2019 Chevrolet Silverado 1500 at Keystone Chevrolet and you’ll see why this is the very best vehicle for your mobile office in Broken Arrow, OK. Although you might not be driving the family around in your 2019 Chevrolet Silverado 1500, you’ll still want it to be safe. You work hard for your family and you want them to know you’re okay while you’re on the job. The 2019 Chevrolet has both active and passive safety features that will help you prevent an accident and stay safe even if you have a wreck. This truck breaks the stereotype that many people have of pick-up trucks. It is not dangerous and handles just as well as any other vehicle. Make the safe choice by buying the 2019 Chevrolet Silverado 1500. It is a great vehicle that will give you peace of mind as you drive around Broken Arrow, OK. The finance center staff members at Keystone Chevrolet are friendly professionals. They are experts in their field and know how to help you make the correct financial decision. Buying the 2019 Chevrolet Silverado 1500 is a big investment and you will want to have some important information before you make the decision. Check out what our experts can help you to do. Our experts can also assist you in finding deals and discounts. Come visit the financial experts at Keystone Chevrolet. They can help ensure that you are making the right decision in buying the 2019 Chevrolet Silverado in Broken Arrow, OK.
Why Keystone Chevrolet Serving Broken Arrow, OK? Here at Keystone Chevrolet, we understand what it means to serve the community of Broken Arrow, OK. We have been in business for years and only hire the very best support staff. From our salesman to our service technicians, everyone you interact with will be friendly and be able to assist in making your purchase as stress-free as possible. We have a huge inventory of new and used Chevrolet vehicles and will ensure that you get the one you want, with all the right options and features. There is no better place to buy the 2019 Chevrolet Silverado 1500 in Broken Arrow, OK. Contact Keystone Chevrolet today for information on dozens of vehicles like this 2019 Chevrolet Silverado 1500 Work Truck. This truck is the perfect blend of utility, comfort and style. There is no reason why you shouldn't buy this Chevrolet Silverado 1500 Work Truck. It is incomparable for the price and quality. This is about the time when you're saying it is too good to be true, and let us be the one's to tell you, it is absolutely true. You've found the one you've been looking for. Your dream car. Contact Keystone Chevrolet today for information on dozens of vehicles like this 2019 Chevrolet Silverado 1500 Custom. Based on the superb condition of this vehicle, along with the options and color, this Chevrolet Silverado 1500 Custom is sure to sell fast. Just what you've been looking for. With quality in mind, this vehicle is the perfect addition to take home. This vehicle won't last long, take it home today. Look no further, you have found exactly what you've been looking for. Contact Keystone Chevrolet today for information on dozens of vehicles like this 2019 Chevrolet Silverado 1500 Custom. You've found the one you've been looking for. Your dream car. This is the one. Just what you've been looking for. You could keep looking, but why? You've found the perfect vehicle right here. The Chevrolet Silverado 1500 Custom will provide you with everything you have always wanted in a car -- Quality, Reliability, and Character. You can find this 2018 Chevrolet Silverado 1500 Work Truck and many others like it at Keystone Chevrolet. No matter the terrain or weather, you'll drive at ease in this 4WD-equipped vehicle. With exceptional safety features and superb handling, this 4WD was engineered with excellence in mind. The Chevrolet Silverado 1500 Work Truck will provide you with everything you have always wanted in a car -- Quality, Reliability, and Character. There is no reason why you shouldn't buy this Chevrolet Silverado 1500 Work Truck. It is incomparable for the price and quality. This is the one. Just what you've been looking for. This 2019 Chevrolet Silverado 1500 LT is proudly offered by Keystone Chevrolet There is no reason why you shouldn't buy this Chevrolet Silverado 1500 LT. It is incomparable for the price and quality. You can finally stop searching... You've found the one you've been looking for. Just what you've been looking for. With quality in mind, this vehicle is the perfect addition to take home. Based on the superb condition of this vehicle, along with the options and color, this Chevrolet Silverado 1500 LT is sure to sell fast. This 2019 Chevrolet Silverado 1500 LT is offered to you for sale by Keystone Chevrolet. You could keep looking, but why? You've found the perfect vehicle right here. There is no reason why you shouldn't buy this Chevrolet Silverado 1500 LT. It is incomparable for the price and quality. The look is unmistakably Chevrolet, the smooth contours and cutting-edge technology of this Chevrolet Silverado 1500 LT will definitely turn heads. Just what you've been looking for. With quality in mind, this vehicle is the perfect addition to take home. This 2019 Chevrolet Silverado 1500 LT is proudly offered by Keystone Chevrolet The look is unmistakably Chevrolet, the smooth contours and cutting-edge technology of this Chevrolet Silverado 1500 LT will definitely turn heads. You could keep looking, but why? You've found the perfect vehicle right here. The Chevrolet Silverado 1500 LT will provide you with everything you have always wanted in a car -- Quality, Reliability, and Character. This is the one. Just what you've been looking for. Keystone Chevrolet is excited to offer this 2019 Chevrolet Silverado 1500. You can finally stop searching... You've found the one you've been looking for. This is about the time when you're saying it is too good to be true, and let us be the one's to tell you, it is absolutely true. Just what you've been looking for. With quality in mind, this vehicle is the perfect addition to take home. The Chevrolet Silverado 1500 LT will provide you with everything you have always wanted in a car -- Quality, Reliability, and Character. Contact Keystone Chevrolet today for information on dozens of vehicles like this 2019 Chevrolet Silverado 1500 RST. You've found the one you've been looking for. Your dream car. The Chevrolet Silverado 1500 RST will provide you with everything you have always wanted in a car -- Quality, Reliability, and Character. This vehicle won't last long, take it home today. The look is unmistakably Chevrolet, the smooth contours and cutting-edge technology of this Chevrolet Silverado 1500 RST will definitely turn heads. Keystone Chevrolet is excited to offer this 2019 Chevrolet Silverado 1500. Take home this Chevrolet Silverado 1500 Custom Trail Boss, and you will have the power of 4WD. It's a great feature when you need to drive over tricky terrain or through inclement weather. You can finally stop searching... You've found the one you've been looking for. The look is unmistakably Chevrolet, the smooth contours and cutting-edge technology of this Chevrolet Silverado 1500 Custom Trail Boss will definitely turn heads. You've found the one you've been looking for. Your dream car. This 2019 Chevrolet Silverado 1500 Custom is offered to you for sale by Keystone Chevrolet. Pull up in the vehicle and the valet will want to parked on the front row. This Chevrolet Silverado 1500 is the vehicle others dream to own. Don't miss your chance to make it your new ride. This Chevrolet Silverado 1500 Custom comes equipped with 4 wheel drive, which means no limitations as to how or where you can drive. Different terrains and varying weather conditions will have no effect as to how this vehicle performs. The look is unmistakably Chevrolet, the smooth contours and cutting-edge technology of this Chevrolet Silverado 1500 Custom will definitely turn heads. You can finally stop searching... You've found the one you've been looking for. This 2019 Chevrolet Silverado 1500 LT is proudly offered by Keystone Chevrolet You could keep looking, but why? You've found the perfect vehicle right here. Just what you've been looking for. With quality in mind, this vehicle is the perfect addition to take home. The look is unmistakably Chevrolet, the smooth contours and cutting-edge technology of this Chevrolet Silverado 1500 LT will definitely turn heads. You can finally stop searching... You've found the one you've been looking for. You can find this 2019 Chevrolet Silverado 1500 LT and many others like it at Keystone Chevrolet. You deserve a vehicle designed for higher expectations. This Chevrolet Silverado 1500 delivers with a luxurious, well-appointed interior and world-class engineering. This 4WD-equipped vehicle handles any condition on- or off-road with the sure footedness of a mountain goat. With unequaled traction and stability, you'll drive with confidence in any weather with this Silver Ice 2019 4WD Chevrolet Silverado 1500 LT. This is about the time when you're saying it is too good to be true, and let us be the one's to tell you, it is absolutely true. This is the one. Just what you've been looking for. Contact Keystone Chevrolet today for information on dozens of vehicles like this 2019 Chevrolet Silverado 1500 RST. You appreciate the finer things in life, the vehicle you drive should not be the exception. Style, performance, sophistication is in a class of its own with this stunning Chevrolet Silverado 1500. No matter the terrain or weather, you'll drive at ease in this 4WD-equipped vehicle. With exceptional safety features and superb handling, this 4WD was engineered with excellence in mind. You've found the one you've been looking for. Your dream car. Just what you've been looking for. With quality in mind, this vehicle is the perfect addition to take home. This outstanding example of a 2019 Chevrolet Silverado 1500 RST is offered by Keystone Chevrolet. There's a level of quality and refinement in this Chevrolet Silverado 1500 that you won't find in your average vehicle. This 4WD-equipped vehicle handles any condition on- or off-road with the sure footedness of a mountain goat. With unequaled traction and stability, you'll drive with confidence in any weather with this Summit White 2019 4WD Chevrolet Silverado 1500 RST. You could keep looking, but why? You've found the perfect vehicle right here. You can finally stop searching... You've found the one you've been looking for. This 2019 Chevrolet Silverado 1500 High Country is proudly offered by Keystone Chevrolet Pull up in the vehicle and the valet will want to parked on the front row. This Chevrolet Silverado 1500 is the vehicle others dream to own. Don't miss your chance to make it your new ride. This Chevrolet Silverado 1500 High Country comes equipped with 4 wheel drive, which means no limitations as to how or where you can drive. Different terrains and varying weather conditions will have no effect as to how this vehicle performs. The Chevrolet Silverado 1500 High Country will provide you with everything you have always wanted in a car -- Quality, Reliability, and Character. This vehicle won't last long, take it home today.